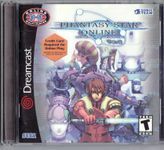 Phantasy Star Online titles are a sub-series of Sega's Phantasy Star series of games that began in 1987. With the exception of Episode III, the PSO games themselves are simple hack and slash type role-playing games where the player slays monsters, levels up, buys new equipment, etc. The online Phantasy Stars differ from the previous games of the series by offering a real-time rather than turn-based approach to combat, seamlessly integrating this with exploration and plot developments. Source: Wikipedia, Phantasy Star Online , available under the CC-BY-SA License.